← Which type of energy saving light bulb is the best value? You don’t need expensive thermal imaging to check if your loft insulation is working well and if you might need a top up. The latest dump of snow is just as good. 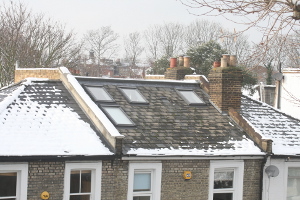 Take a look at your roof – if the snow on your roof has melted faster than the houses either side of you it is a strong indication that more heat from inside your home is escaping through your roof – and melting the snow in the process. There are some factors to consider in your comparison. Do you or your neighbours have a loft extension or room in the roof that they are using? Or are they away? If they are not heating this room and they have closed the doors it might seem like they have more insulation than they actually have. If you think that your roof could do with some insulation, let us know and we will be able to connect you to accredited installers – why not give us a shout now? This entry was posted in Energy Solutions and tagged loft insulation. Bookmark the permalink.